Prince William County, Virginia. "Along Bull Run near Sudley Church. March 1862." Each of the dozen or so sticks lined up in front of the boys marks a grave. Wet plate glass negative by George N. Barnard. View full size. Submitted by murphcon on Sat, 01/31/2015 - 3:49am. Here's a link to an article with several other views of these kids. They are most likely the Thornberry kids and one picture shows them standing in front of their own house. Their father was a confederate soldier who was wounded at First Bull Run. He was pulled out of his house by union troops and almost lynched for spying. "After my father got back, living in his own home, a terrible noise was heard one night about 2 o’clock. Ten Federal soldiers came to our home and burst the front door down. A piece of it struck my mother in the face and disfigured her very badly as well as hurting her. They arrested my father…for [spying]. … The next morning before taking them to Washington, the soldiers got a rope to hang my father, placing it around his neck. This did not occur in our house but just outside of our yard. My brother begged and cried like a baby not to hang his father, “He didn’t do anything.” One of the men said “Search his pockets before you draw that rope.” There they found a diary of his whereabouts. That saved him; he always kept one." Submitted by E Ticket on Sat, 08/20/2011 - 11:49am. Very interesting story. I remember my grandfather born in 1905 telling me how when he was a boy in school, on Veterans Day their grandfathers would come to school and tell about their experiences in the Civil War. My great great grandfather had apparently served with the Union, an abolitionist from Charleston now West Virginia. 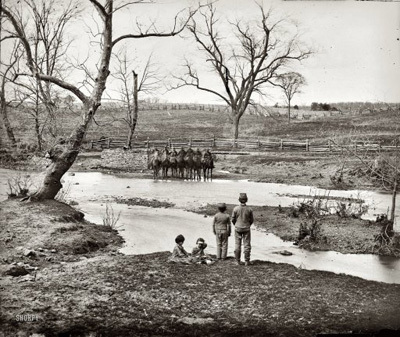 Was in both battles of Bull Run. He was a disappointing teller of stories to my grandfather, because all the other vets told hell-for-leather stories of battle, he instead would apparently not glorify what must have been an awful experience, but instead would tell little tidbits and nuances. Apparently, my GGF's memory in one of the battles had to do with being stationed behind a hill. The Confederate cannon were shooting into the far side of the hill, and the cannonballs were rolling up and over the hill and down the other side where they were waiting, and were apparently too hot to touch with bare hands. Seeing this picture of the hillside, I wonder if it was here that those cannonballs rolled. Submitted by Louise on Fri, 08/05/2011 - 9:38am. Do these graves have markers? There's obviously no way to tell who these individuals were; there may have been none even after the battle. But do they have individual stones for the "Unknown"? My father used to drag us out to graveyards as children, although we were looking for deceased relatives. In New Jersey, there were still a great many family plots, as well as abandoned churchyards, dotting the landscape in the hinterlands. As a child, I hated looking at the headstones. The whole pastime seemed morbid. 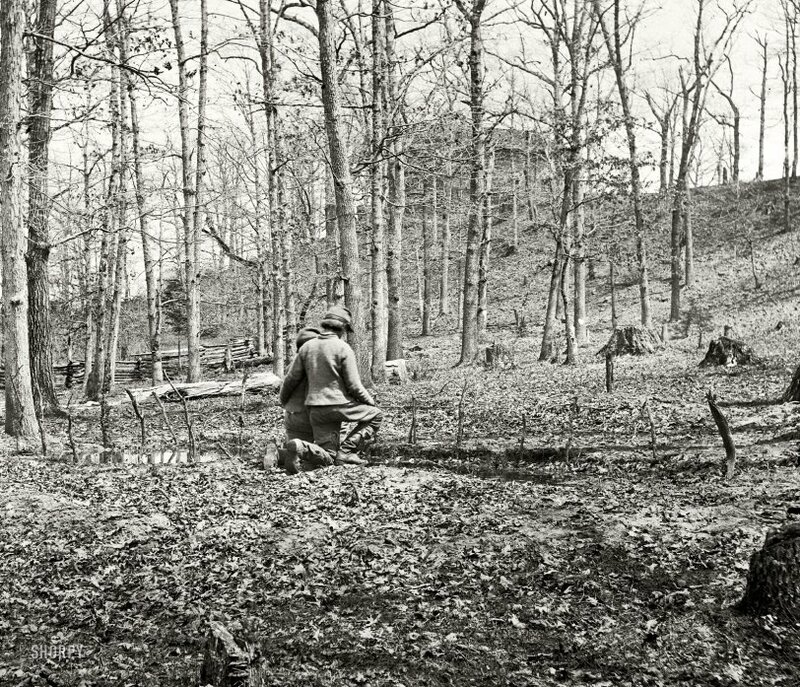 Now, though, I realize that my father had inherited a "Civil War devotion" to the graves of the ancestors that had struggled to create the America we inhabit today. He remembered all the memorial services that *he* had been brought to as a young boy. Some of his earliest memories would have been of his great-grandfather, who lived until my father was 8. His great-grandfather lived until his 90s, and as a teenager had been brought from New Jersey to Gettysburg to help inter the swollen corpses of the fallen into the cemetery. At that battle, here were more than 7,000 men killed, and 3,000 horses, all lying where they had fallen. It created a major public health emergency for a town of 2400- 4 corpses for every inhabitant, an impossible number for the residents to handle alone. Gravediggers were called in from as far away as New York City. Apparently my great-great-grandfather deeply impressed upon my dad the reverence that one showed to the bodies of the deceased servicemen. 150 years later, I can only view Civil War dead philosophically, not viscerally. For these boys, they would have been kneeling by the graves of men they had known and perhaps loved. In that respect, they were standing in for millions of Americans in every state and territory, who had lost loved ones in the War. Certainly, that would have been Barnard's intent, whether he posed the scene or not. Submitted by Vintagetvs on Thu, 08/04/2011 - 5:55pm. but the anguish comes through the Photo like it was last week. I wonder if they were brothers, friends, Cousins, was it someone they knew in that grave? Lost in memories and sadness? Submitted by Dutch on Thu, 08/04/2011 - 5:09pm. Perhaps they were drummer boys. It wasn't unusual in some outfits to be comprised of an entire town. So when there was a lot of slaughter, a couple of drummer boys could have lost uncles, father, brothers. Submitted by Mr Mel on Thu, 08/04/2011 - 3:08pm. Submitted by zoeblueyes on Thu, 08/04/2011 - 1:55pm. As a kid I hated going to the Battlefield. My mom used to drag us out to all the historical sites, or worse, stop on the side of the road and read the historical markers. As an adult with my own child to embarrass, I now realize just how lucky we are to live so close to such an important piece of history. Submitted by fanhead on Thu, 08/04/2011 - 1:10pm. Thanks to Ken Burns whenever I see a Civil War scene on Shorpy or anywhere else, "Ashokan Farewell" starts playing in my head and stays there the rest of the day. I was surprised to learn it was the only modern song used in the series, being written by Jay Ungar in 1982. Submitted by GordonJones on Thu, 08/04/2011 - 10:07am. They appear to be the same boys seen here. Submitted by switzarch on Thu, 08/04/2011 - 8:59am. Just logged in and saw this moving picture. Thank you.